Let's be honest. 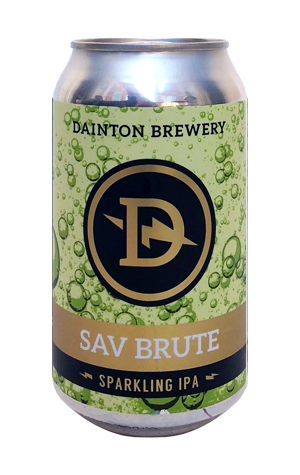 There's few among us in Australia that really know what a Brut IPA is supposed to taste like yet. We've had some so dry all aroma and flavour has been stripped out and others that are rather more enjoyable yet don't seem to tick the alleged "style" boxes so assessing one to style is a pretty meaningless endeavour. That said, we reckon this one from Dainton could be close to working out what the right track at least is. Brewer Cam Turner used a sauv blanc wine yeast here, a decision of which he says: "the style is still freestyling a little, we just thought it needs to be a beer-wine hybrid not just in terms of dryness." It's a decision that, despite there being no Kiwi hops involved, has conjured lean gooseberry and grape aromas atop a beer that's equally lean and grippingly dry (more than grippingly bitter) on the palate. There are still some rounded qualities to the mouthfeel, however, aided and abetted by a little oily sweetness.